Maybelline recently launched their Color Sensational Creamy Matte lipsticks and I heard that it's mostly sold out, especially Touch of Spice. Allow me to walk you through the ones I have in my stash and tell you if this is truly worth picking up. #MakeItHappen is the new game-changing mission for Maybelline and that means rolling out the most coveted beauty products in the market at an afordable price with high-end quality. So far Maybelline's been wow-ing me with their new releases especially their new Color Sensational Creamy Mattes. To tease us, they came out first with three shades that's been dominating the social media. Divine Wine, Vibrant Violet and Touch of Spice. You'll know they're Creamy Mattes by their plum matte covers. Pretty chic, right? Maybelline's Creamy Mattes live up to it's name. It truly has a creamy consistency that glides on to the lips nicely. No tugging, no dragging needed! It doesn't feel like it sits on top of your lips either. The best way i could describe how this lip color is how a silicone primer feels against the skin. I was told that Creamy Mattes contain essential oils to make it less drying. I wonder how they were able to maintain the matte finish with the oils in it. But i ain't complaining! Mattes no longer has to be unforgiving and drying! So psyched Maybelline finally released it here in Manila. And for a P299 proce tag, this is a steal. As expected though, a good matte lipstick that doesn't dry out the lips is not transfer-proof and may bleed from time to time. BUT (wait! there's a but!) they fairly last long like regular mattes. If you don't eat with it, the color will stay on without cracking or bleeding for a good 4 to 6 hours. With eating though, you may have to retouch after as it will fade and may bleed on the outside of your lipstick. while it may survive a glass of wine, smacking your lips and wetting them may cause it to bleed and that's not a good thing. And like most mattes, some shades may settle on wrinkly lines of the the lips so better exfoliate them to avoid this and dry patches, too. Touch of Spice is keeper! It's my favorite among the three because it is wearable and easy to apply. I love the rose plum shade and how well it flatters my warm skin tone. It did settle a bit on the lines but still looks really good! I heard that this shade is always sold out now so I'm glad I already have it! Divine Wine is similar to MAC Diva, a deep russet red that makes any skin look fairer! I'm not usually drawn to red shades but I would make an exception for this. These days, I prefer deeperand darker tones of red than the brighter and truer ones. I know, I surprise myself, too, considering I had a long time love affair with MAC Ruby Woo. Blame it on age and maturity but I much prefer classier shades. LOL! Vibrant Violet is surely a character! I don't think I will be wearing this anytime soon but who knows! If you've been itching to try MAC Herione but unsure to splurge on it, you can experiment with Vibrant Violet first. It's brighter and softer in tone but it still is purple and will surely catch some attention. Partner this with fierce cat eyes and contoured cheeks for a rockin' makeup look! 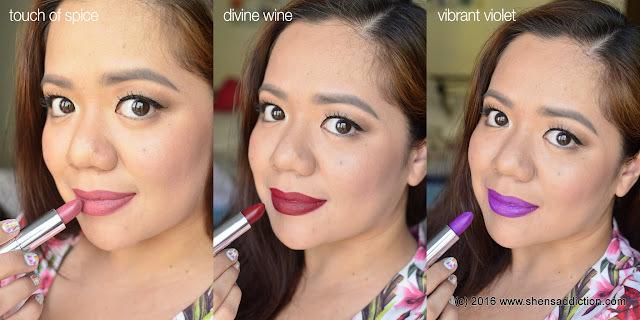 Overall, I find the Maybelline Color Sensational Creamy Mattes worth getting. If you're on a hunt for a matte lipstick that won't dry the lips, Maybelline Creamy Matte is a great choice! You can have your matte and eat it, too! Sans dryness and in shades that will suit you! You can get these at your favorite Maybelline counter, on Zalora.com.ph and BeautyMNL.com. I'm sure Vibrant Violet looks awesome on you! Will visit your blog to check it out! I miss you!